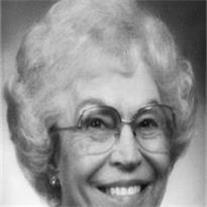 Olive Morris of Mesa, AZ passed away peacefully on June 26, 2010 just days shy of her 90th birthday with her family by her side. She married her high school sweet heart, Duke Morris, in 1939. They were married 68 years. She is survived by her 6 children, Earl (Sadie), Jerry (LaNelle), Yvonne, Paula Macdonald (Bob), Kirk (Carla), and Jeanie. She had 24 grandchildren and 50 great-grandchildren. One daughter Louise preceded her in death. Olive was a loving wife, mother, grandmother, sister and friend and her loving influence will be sorely missed by all. Olive and her husband Duke were the owners and operators of Falcon Cleaners for 54 years. At the age of 45 Olive went back to school to become an elementary school teacher and later obtained a masters degree. She was an active member of the Church of Jesus Christ of Latter-day Saints and served in many callings throughout her life; including a full-time mission to London England with her husband. She was an accomplished seamstress and at the age of 16 won second place in a national 4-H design and sewing contest. She sewed many favorite outfits for herself and her children throughout her lifetime. Visitation will be held from 6-8 pm on Friday July 2, 2010 at Bunker’s Garden Chapel, 33 North Centennial Way, Mesa, AZ. Funeral Services will be held on Saturday July 3rd at 11:00 am, at the Church of Jesus Christ of Latter-day Saints Beverly building, 1054 West 2nd Place, Mesa. Interment to follow at the City of Mesa Cemetery. My mother was Norma Minke. She worked at Falcon Cleaners for nearly 20 yrs. I remember going to Duke and Olive’s home for Falcon Cleaners Christmas dinner and ill never forget Olive’s chocolate torte.